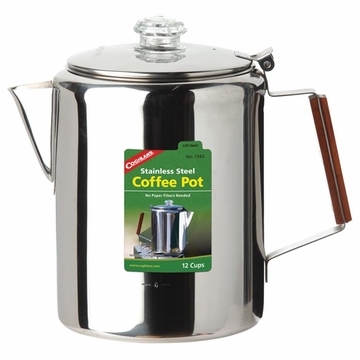 "Coffee percolator crafted with tough 18/8 stainless steel with a glass percolator top. Precision-fit parts and seamless construction ensure lasting durability. Includes a two-piece basket percolator system. Hinged lid with a stay cool permawood handle. Dishwasher safe. "